Real Name: Billy - William Grange; Katie - Kathleen Grange. Identity/Class: Unknown - human mutants? Each of them utilises a weighted nylon line to lasso things. The end of the line has claws on it for hooking objects it is thrown at. The line itself is extremely strong - not only can it hold the weight of a child without breaking, but it is also strong enough to be used to tie up adult criminals. History: Schoolboy William Grange had lived with his Aunt Mabel since the day his parents, both of whom worked for the police, were killed in a car crash caused by the getaway car of a group of bank robbers. 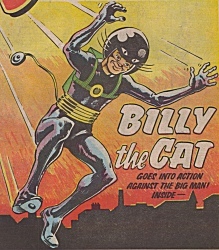 As a result William vowed to use his amazing abilities to fight crime, as the heroic Billy The Cat! His amazing gear had been completed by him from designs made by his father, a clever inventor. This doesn't explain how either cousin got their powers though. Comments: Created by David Sutherland. Billy and Katie adventure mainly in the town of Burnham, where they go to the local Academy as pupils. The two adventurers are well respected by the community - the police are more than happy to arrest people on their say so, which is good going for a pair of twelve year olds! (And that's assuming they are even that old). Also the local army officer sees pitting them against his men in field maneuvers as good training for his men and a challenge for them. The two characters are cousins, and considering the similarities between their civilian names and their hero identities, and the fact that William and Kathleen seem to spend all their spare time together, their friends and associates must be less intelligent than Lois Lane for not putting two and two together. 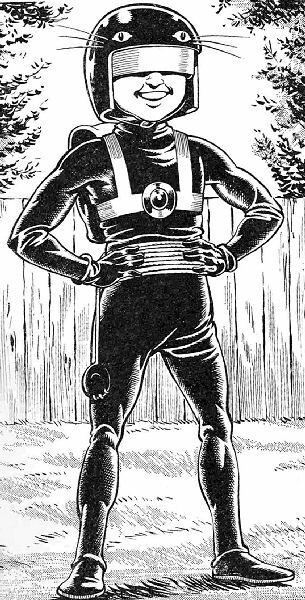 Their costumes consist of black leather cat-suits, with black backpacks (which at a guess hold their civilian clothes) attached by yellow straps. They wear crash helmets, modified to look like cat's faces, to hide their identities. 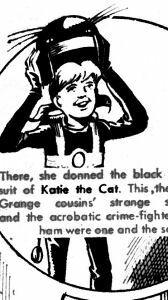 Since Katie wears a short skirt as part of her school uniform, the two must keep their costumes hidden in their school bags, because on at least one occasion they switch identities in an alley on the way home from school. How they fit helmets, leather suits and school books in to one satchel, I have no idea. Since I wrote the above paragraph, Tony Kehoe has been in touch to say "you ask rhetorically whether Billy (and Katie) carried their costumes in their schoolbags. I can tell you unequivocally that the answer is yes, because I remember a BtC episode from before Katie joined Billy in which Billys headmaster becomes suspicious that one of his pupils is BtC, and so Billy (William Granger) hides his costume in the school boiler room before his bag is searched. That still doesnt answer the question of how it all fit in the duffelbag, though. Maybe his school bag is like the TARDIS: bigger on the inside?" When Billy reappeared in Buddy he was visibly older, now in his mid to late teens. Katie didn't seem to be around and the town seems to be named Marham, which perhaps implies Aunt Mabel has moved to a new town. Billy isn't on as good terms with the authorities in his new home - after defeating some muggers he departs the scene as the police arrive, thinking "The police. Time to make myself scarce." He also doesn't seem to be as agile as he used to be - guess puberty brings that clumsy stage to every boy, even the superhuman ones. Billy recently returned in the pages of the Beano Annual 2003, and has appeared in each annual since (now up to 2008). He has also made several reappearances in both the comic (for six weeks from October 11th 2003, and again about once a year since). Again he is seen to be in his mid-teens, but interestingly enough, the adventure has him accompanied by his father. Of course the real reason for this is that it's been years since he was last seen and British comics aren't renowned for their continuity. However sad fanboys like myself like to work out how to fit all the pieces together neatly - so perhaps William got himself adopted, or, (and this is the explanation I favour), since his father is only called "Dad", he is William Grange Snr, the original Billy, and this is William Grange Jnr, his son. If Billy was in his late teens around 1981 then he is just old enough to have a teenage son. Katie returned to action alongside Billy in 2005, in an 8 part tale scripted by Mike Chinn and drawn by Nigel Dobbyn. Mike informs me that, assuming things work out, we'll be seeing more of Billy and Katie in the forthcoming year. 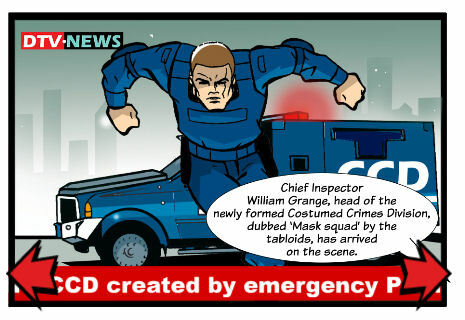 In 2013 an adult William Grange appeared in the digital Dandy's Retro Active superhero strip, now working as a police officer, like his late parents, and in charge of the Costumed Crimes Division. 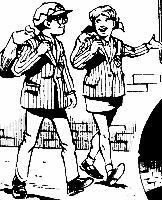 Grant Morrison had Billy and Katie turn up as teenagers in Zenith Phase Three, under the pseudonyms of Tiger Tim and Tammy. Like most of the other heroes he cameod, they died at the hands of the Lloigor, though not before their demonic assailant came to the conclusion that the two were having a sexual relationship. At the time I thought this was Morrison being perverse, but having seen the strip for myself I can see where he got the idea. Greg Ash informs me that "Billy was parodied recently in the adult comic Viz. It was called "Barry The Cat" and was written in the same style as the comedy film "Mystery Men". In it, young Barry Barrington is shown as some sort of social misfit who dresses up to fight crime completely ineffectively. During the strip, he is shown jumping from trees onto moving cars despite the fact he obviously has no powers or skills whatsoever. Also, unlike every other superhero comic strip everybody immediately recognises him despite his mask and costume."